To begin the process of learning the layout of the piano keys, a piano key chart may be handy . But to really become familiar with the keyboard, you must start learning to play some tunes, learn to read music, learn scales and chords, play some simple music, and then some more complex music, and then some even more complex music, and then... well, it takes a few years and plenty of practice. If you devote yourself to a few years of consistent practice, along with some piano lessons along the way, you will probably find yourself wanting to play and play and play, for the piano offers musical thrills for a lifetime. Hopefully then, this chart is only a beginning. 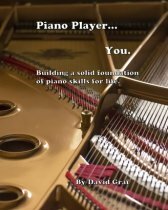 For a fairly goofy, yet effective, trick for learning and memorizing the layout of the notes on the piano, click here:"Piano Notes Chart". This trick shows how you can learn the notes without having to "count up" from A, or from C, which is common among beginning piano students. With the ability to go straight to a note, your ability to learn music and find your way around the keys will be greatly enhanced. This chart shows how all the white notes are labeled. To see how the notes are written on the staff, go to "Piano Notes" . If you are interested in learning to read music, go to "Reading Music" . For ideas on how to learn to play the piano, go to "Free Piano Lessons" . Perhaps you want to know the names of every note. The following is just a close-up picture of 19 keys, with the names of each note. Notice that many have two possible labels. What is not shown is this diagram is the fact that "double-sharps" and "double-flats" are also possibilities, but do not worry too much about that. When those double-sharps and double-flats show up in music, it is not hard to figure them out. Naming the notes may seem like a fairly academic (and unmusical) procedure, but it will help you with all areas of piano study. Learning tunes, reading music, learning your scales and chords, memorizing music... all will be easier with the names of the notes popping up in your head as guides to the structure of the music, harmony and melody. For the pianist, knowing the notes is just the tip of the iceberg of music theory.